Stylish, practical and popular, Café style shutters make an amazing visual impact within your room and viewed from outside. The lower portion of your window is covered, with the top left open to natural light. Our Cafe style shutters are typically installed to cover the lower half of the window, but you can choose to make them higher. Where privacy is the priority, it isn’t uncommon for us to fit shutters that cover the bottom two-thirds of the window. 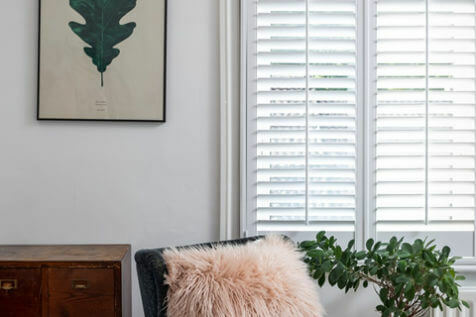 Traditionally, Café style shutters are found on Victorian, Georgian and Edwardian box sash windows, but they also bring a unique sense of style to modern homes, dressed with curtains or not. Café Style Shutters are used on the lower portion of a window and allow for maximum light entry, yet still provide a good level of privacy. These shutters are both stylish and practical and very popular among many of our customers. They make for a fantastic visual impact both inside the home and externally. You often find this style of shutters on Victorian, Georgian and Edwardian properties with traditional box sash windows, but these can be designed and installed to fit many different properties and rooms. This style of shutters certainly does not look out of place in modern homes and work well with UPVC double glazing if you require. 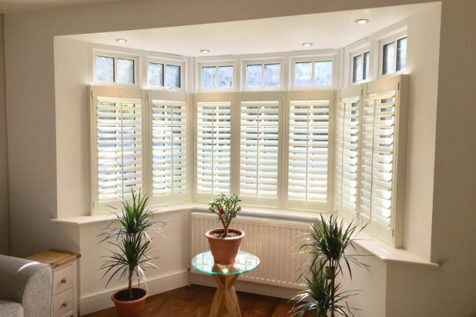 Like all of our shutter range, there are many different styles and colour combinations to choose from, which will compliment any style of home and interior décor. Café Shutters feature a bottom section panel with the top open to natural light. This is a traditional style which is favourable among money of our clients and great for those looking mainly to control light and privacy at a lower level only. 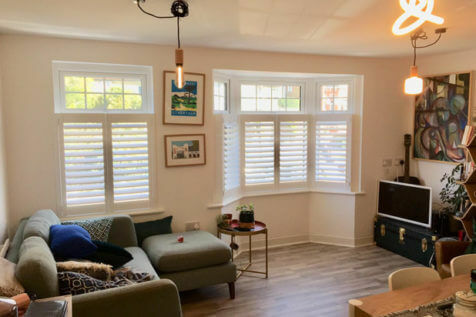 Our Café Style shutters look fantastic dressed with or without curtains and can typically cover half the window, although it is not uncommon for us to fit shutters that cover around two thirds. 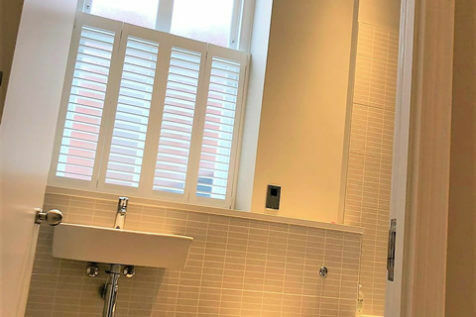 Whatever your preference on height, these shutters offer maximum privacy when needed and are great for those that live in built up areas. As with all our shutters they can be finished in a multitude of different paints and stains depending on your preference. You can pick the sizing of the louvres, type of tilt rod system you wish to be fitted and select from optional extras to really make your Café Style Shutters stand out.